This paper explores the strategic importance of information systems for managing such crises as the H1N1 outbreak and the Haiti earthquake in the healthcare service chain. The paper synthesizes the literature on crisis management and information systems for emergency response and draws some key lessons for healthcare service chains. The paper illustrates these lessons by using data from an empirical case study in the region of Crete in Greece. The author concludes by discussing some future directions in managing crises in the healthcare service chain, including the importance of distributive, adaptive crisis management through new technologies like mashups. Recent events from the SARS and H1N1 outbreaks in 2003 and 2009 respectively, to natural disasters such as hurricane Katrina in 2005 and the Haiti earthquake in 2010, have exposed the global healthcare service chain to high alerts of threat and disaster. Before these events, service chain management has been largely overlooked in healthcare even though the potential for direct risk reduction and improved quality of service delivery is significant. For example, after the outbreak of H1N1 it became evident that flu vaccines were in short supply in parts of the world (Belluck, 2009). Evidence shows that, among the few firms that are presently involved in the production and delivery of flu vaccines, there was a switching from the production of seasonal flu vaccines between 2009-2010 to the production of the H1N1 vaccine, with increased shortages of the former and delayed deliveries of the latter (Dooren, 2009; McNeil, 2009). In turn, in February 2010, it was estimated that 57 million people in the US alone had contracted H1N1 from which 257,000 were hospitalized and 17,000 died (Falco, 2010). As evident from this example, the lack of attention on healthcare service chain management is largely due to a strong emphasis on healthcare supply chain management. The key difference between the two is that the latter places sole attention on the production, storage, distribution, and ultimate delivery of healthcare-related products such as flu vaccines, whereas the former places attention on healthcare services such as the management of flu vaccinations, communication about the behaviour of the H1N1 virus, and provision of related emergency services to affected and vulnerable parts of a population. The recent focus on healthcare services rather than products (Corbin et al., 2001; Scotti et al., 2007), is part of a broader shift in management logic, from a product-dominant one, in which the outputs and discrete transactions of tangible (manufactured) goods was central, to a service-dominant one, in which intangibility, exchange processes and relationships are central (Vargo & Lusch, 2004, 2008). In this new service-dominant logic, services are defined as “the application of specialized competences (knowledge and skills) through deeds, processes, and performances for the benefit of another entity or the entity itself” (Vargo & Lusch, 2004, p. 2). The importance of relational performances is particularly evident in healthcare service chains where the continuity of operations is vital to human welfare and the span and quality-of-life of patients. This is even more so in the case of crises such as natural and environmental disasters (e.g. floods, earthquakes), technical or mechanical disasters (e.g. gas leak), and human-induced threats or activities (e.g. epidemics, terrorist acts), where specialized competences, as performed by emergency personnel, could have significant consequences on the human welfare of both directly affected individuals, as well as the larger population of vulnerable geographical areas. 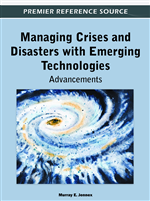 Such crises have been extensively examined and analysed within the field of crisis management. Crisis management is defined as a systematic attempt by organizational members to identify and detect possible crises, take actions and measures to prevent them, contain their effects or disruption, and finally recover (Pearson & Mitroff, 1993; Preble, 1997; Smits & Ally, 2003). However, crisis management (and disaster research more generally) is by nature a multidisciplinary field, with researchers coming from different research areas (e.g. environmental science, economics, sociology), and with each field attaching its own perspective (Quantarelli, Lagadec, & Boin, 2007). As a consequence, there are few if any comprehensive crisis management or disaster relief process models that would encompass all possible definitions of a crisis (Quantarelli & Perry, 2005; Boin et al., 2005).